Hypertension is one of those conditions which often presents a real challenge to conventional medicine. It is frequently classified as ‘essential hypertension’ – a range of symptoms with no known cause or cure, but which it is vital to control. To this end, doctors prescribe lifelong medication with varying levels of activity, some of which can be toxic. Since hypertension is specific to each individual, doctors often have to modify prescriptions and treatments - what works for one patient may not work for another. Substances that help control high blood pressure can be found in a number of natural medicines, particularly from the field of phytotherapy: garlic and onion extracts (quercetin), olive leaf extract, as well as potassium and L-arginine … although here again, it can be difficult to find the most effective alternative as each case will be different. A new plant extract, traditionally recognised for its hypotensive and purifying properties, has just been patented: celery seed extract, standardised to more than 40% total phthalides (butylphthalides and sedanenolides). This new product has powerful, scientifically-supported hypotensive characteristics, and most importantly, no toxicity. Scientists have named it ‘3nb’ (3-n-butylphthalide) - the compound also responsible for the characteristic smell and taste of celery which, along with carrots, parsley and fennel, is a member of the umbelliferous family. 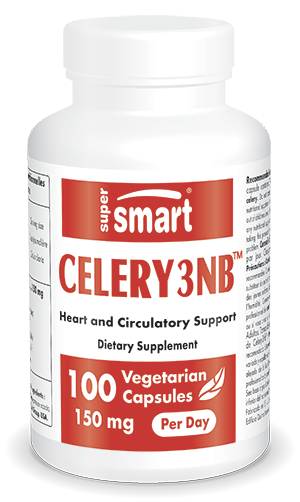 In research conducted at Chicago Medical Center, 3nb was identified as the component responsible for celery’s blood pressure-lowering effects. Blood pressure measuring approximately 160 over 100 was lowered to 120 over 80 in just one week. Animal studies have generally reported decreases in blood pressure of around 14%, as well as approximately 7% lower cholesterol levels, another risk factor for cardiovascular disease. It has a dual action, functioning both as a diuretic and vasodilator through production of prostaglandins, a little like the calcium channel blockers which counteract hardening of the arteries and cholesterol deposits on vessel walls, and thus prevent potentially serious consequences for blood supply to the brain. Animal studies suggest that celery seed extract may prevent strokes, improve cerebral circulation and protect the brain in a similar way to Ginkgo biloba. This clear hypotensive effect is primarily linked to its diuretic action. Most conventional diuretics actually alter the sodium/potassium ratio and as a result, dangerous side-effects can occur when potassium or sodium in the blood reaches unacceptable levels. In contrast, despite being a diuretic, Celery 3nb™ has no such effect on this ratio. What other effects have been identified for Celery 3nb™? In animal research, Celery 3nb™ has shown promise as an anti-cancer phytonutrient, but its most significant other effect is an analgesic one, providing relief for joint pain (arthritis, rheumatoid arthritis, fibromyalgia) and gout, possibly due to decreased production of toxic uric acid by obstruction of xanthine oxidase. Trials have also broadly shown it to be as effective for muscle pain as conventional NSAIDs, and with no unwelcome side-effects. In a recent clinical study of 70 patients, it produced clinically- and statistically-significant reductions in pain intensity and improvements in mobility and quality of life after just three weeks’ administration, with no side-effects. While researchers do not yet know its specific mechanism of action, it seems celery seed extract may rebalance the prostaglandin system, unlike aspirin and Cox-2 inhibitors which block prostaglandin production by acting on specific enzymes. • longer life expectancy in animals. For optimal efficacy in controlling high blood pressure and relieving joint pain and gout, the recommended dose is two capsules a day. Other ingredients: magnesium stearate, microcrystalline cellulose, silicon dioxide. Celery3nb™, Anderson Global Group, USA.